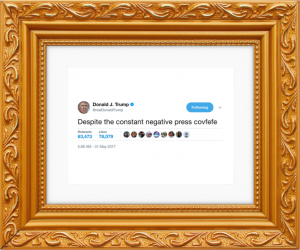 For around $50, Framed Tweets will give your chosen Kanye, Trump or other celebrity tweet the so-called “royal tweetment” by printing out a hard copy and putting a frame around it for display. 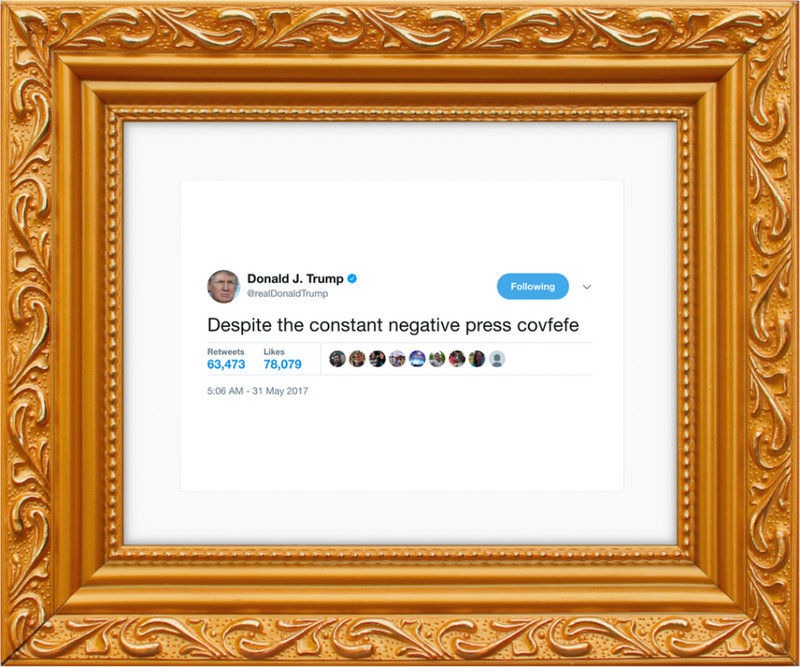 Framed Tweets advertises some of the more notable 140-or-fewer character messages on Twitter, including those later deleted by the account holder. Naturally, those of us on the Internet & Social Media Law Blog can’t help but consider the legal implications of this concept. Could this be a violation of Twitter users’ copyrights? In most cases, the answer is probably not. Here are some reasons why. First and foremost, many tweets consist of recited facts, which are not eligible for copyright protection. As the Supreme Court made clear “[n]o one may claim originality as to facts … because facts do not owe their origin to an act of authorship.” Many tweets merely describe what someone is doing or where they are, something that happened, or link to a news story. One of the featured tweets on the site is from 50 Cent: “I can’t believe my mothers making me take out the garbage I’m rich f—k this I’m going home I don’t need this s—t.” Though amusing to some, 50 Cent’s tweet is likely ineligible because it simply states facts about what he was doing at the time. “Hate it or love it,” that’s the law. There’s also the issue of originality. At 140 characters, the character limit on Twitter limits the opportunity for Tweets to obtain the level of originality required for copyright protection. Although copyright protection depends much more on the creativity of the tweet than the length, Twitter’s character limit does present another hurdle. The Supreme Court also made it clear that “copyright protects only those constituent elements of a work that possess more than a de minimis quantum of creativity.” This concept is known as the “de minimis doctrine,” which stems from a longer Latin phrase meaning “the law does not take notice of very small or trifling matters.” Although the question of what is trifling may be up for debate, in the world of copyright, works must contain more than a trivial amount of original expression to deserve copyright protection in the eyes of the law. The Code of Federal Regulations further provides that “words and short phrases such as names, titles and slogans” are not copyrightable because they contain a de minimis amount of authorship. Simply put, this all means that shorter phrases like tweets must demonstrate a relatively high level of originality to warrant protection.